Avery has some great Pro-Staffers; but there is one particular who stands out in our minds. His name is Tony Vandemore. Tony and his dog, Ruff, hunt more days than anyone we know. Although he probably wouldn`t admit it, we think Ruff and Tony hunt waterfowl somewhere around 160 days a year. Ruff is one of those maniacal retrievers that live for nothing more than retrieving. He runs so hard that not only is he a danger to anything in his way, he has been known to hurt himself. It took Avery 18 months, 4 engineers, and 8 different designs to finally build a stand that Ruff couldn`t tear up. It`s light, strong, and extremely durable and without a doubt the most versatile dog stand in the world. 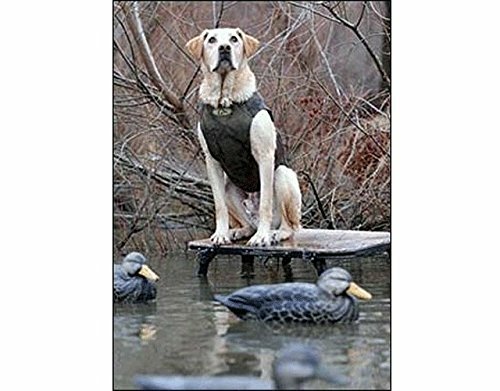 Whether you are hunting a pothole in the Dakotas, a green timber hole in Arkansas, or you need a great place to throw your training gear at the line, there is no better dog stand in the world.